When most homeowners consider new windows they automatically expect to have the change the old frames for new ones. However, if the old frames are in good condition or you wouldn’t want to change them from traditional to modern, secondary glazing can be the answer. Often referred to as secondary double glazing or secondary windows, secondary glazing consists of a single glazed frame installed inside your existing windows and doors (fitted between the reveals, without removing the old frames). 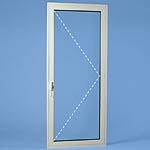 The glass is generally secured by compression gaskets into extruded aluminium frames which are normally coloured to match the host windows and doors. These aluminium frames are mounted on hinges, rollers or spiral balances into an aluminium outer frame, allowing some of the panes to open – this being determined by the design of the secondary glazing. For existing windows with individual fixed panes, a fixed pane of secondary glazing can be fitted, which can be lifted out for cleaning purposes. 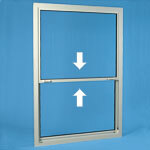 Secondary glazing styles also include hinged units which open inwards and horizontal sliders or vertical sliders. 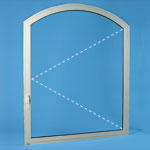 Bespoke secondary glazing can even be manufactured and installed in arched and shaped frames. 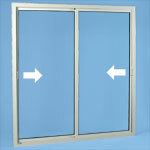 What about the appearance of secondary glazing? The inherent strength of aluminium extrusions means that they can be manufactured as quite slim profiles and secondary glazing is generally designed so that its vertical and horizontal profiles line up with the outer frame, transoms (horizontal) and mullions (vertical) of the host window or door. 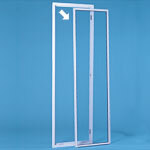 The frames of secondary glazing can therefore appear almost invisible from outside. For most suppliers and installers, the aluminium extruded frames are white as standard but can generally be supplied to match some woodgrain finishes and any official RAL colour. RAL refers to a colour matching system first developed in the 1920’s to allow architects, manufacturers and specifiers to refer to a distinct colour by a code name so that everyone would understand exactly which colour it was meant to be, without having to exchange samples. The system has been developed over the years to include both matt and glossy surfaces and is divided into various classifications. In common parlance, RAL refers to the RAL Classic classification, and includes powder coating, a system of colouring aluminium. There are many benefits to secondary glazing including insulation, noise reduction, value for money, security and its use in conservation areas due to the fact that it is virtually invisible from outside the property. Secondary glazing, especially when low emissivity glass is used, improves the thermal efficiency of the host window to a point where it can actually be better than insulating glass sealed units. 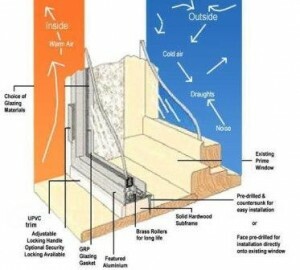 It also reduces draughts and therefore cuts down on heating bills by saving energy. The gap between the glass in the host window and secondary glazing is normally considerably wider than that in most insulating glass sealed units. Consequently, its performance in terms of noise reduction from outside traffic for example, is so much better. When the installation of secondary glazing is specifically for this purpose, laminated acoustic glass can be used, often in conjunction with acoustic panels attached to the reveals, between the host window and the secondary glazing. We have recommended this approach to noise reduction with some success, particularly in a case where it improved the quality of life for residents who lived near to a restaurant which played live music. It can work to keep noise in – as well as out. Installing secondary glazing is much cheaper than replacing the host window or door and has the added benefit of very low maintenance. Because secondary glazing can only be opened from inside the property, it will improve security of the host window or door, especially when fitted with laminated glass. In some conservation areas and in historic and listed buildings, the host windows and doors are subject to restrictions which either prevent them from being replaced or if so, the new ones must be ‘like-for-like’ in appearance and hence can be very expensive. Secondary glazing offers the benefits referred to above without the cost of replacement windows and, often more importantly, without spoiling the character of the existing fenestration or the overall appearance of the property.